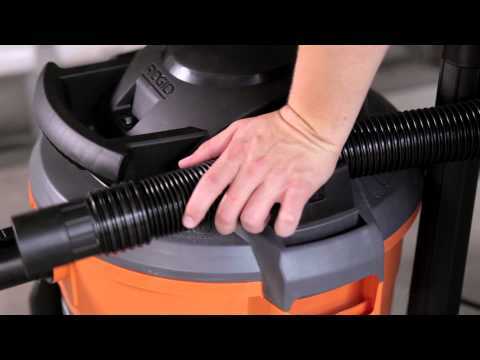 12 Gallon Wet/Dry Vac is rated 4.6 out of 5 by 707. Rated 5 out of 5 by Disue from Great product This vac is excellent for our work shed. It has a high capacity tank and is very powerful. Rated 1 out of 5 by OCDClean from The mechanical design lacks real world experience. I recently purchased Rigid's WD12701 Wet/Dry Vac. Sadly, after muscling the hoses together I started to clean my wood shop. I quickly and irritably realized that the Vac's Output is on the exact same side as the Intake! Simply put, whichever direction your hose is headed, the (mighty) Vac's output blows debris and dust - always too quickly and usually out of reach. Secondly, the suction does not match the output. Not sure if my WD12701 is defective or it is just mechanically flawed to vacuum simple sawdust and small debris. Sageness tells me that there obviously wasn't must real-world experience, insight or testing put into the WD12701's mechanical design. It is flawed and extremely disappointing for the money. Even more so, I am very disappointed in my shortsighted decision to purchase it. Rated 5 out of 5 by jima from Great vacuum out of the box This vacuum is great and meets all my specifications right out of the box. The assembly was easy and was up and cleaning in a few minutes. Rated 5 out of 5 by MikeB7 from Best Vacuum with Best Company Backed Coverage Best Vacuum with Best Company Backed Coverage. They truly stand behind their product. Well made and perfectly priced. Rated 5 out of 5 by crowl2341 from Great Vac for my workshop This vac performs as advertised. I have combined it with the Home Depot "Dustopper" and 5 gallon Homer bucket. This combination makes easier disposal of sawdust and keeps the shop vac and the filter clean and clog free. Really love this combination for clean-up. Well worth the money. Rated 5 out of 5 by RayMc from Plenty of power and exceeded expectations We used this wet/dry vac for wet operation to get water off of the basement floor during minor winter flooding. It worked great with plenty of power to vacuum up the water that was seeping in. We used it for many hours straight and it worked great. 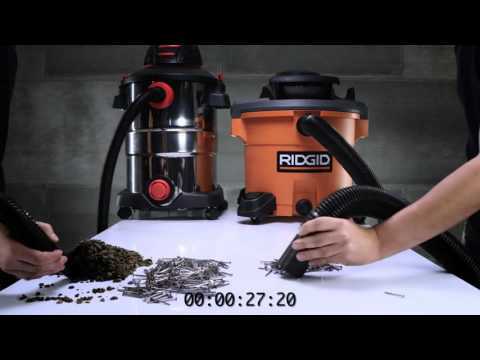 We chose Ridgid because of its high quality and ultra durability. Rated 5 out of 5 by JeffTH from Needed a wet/dry vac in a hurry! Due to a combination of warm weather, rain, and frozen ground, many in my area are experiencing water in their homes for the first time. I have a 20 yr. old Craftsman shop vac, and did not want to find myself in a position where it pooped out. I headed to my nearest HD, and picked up the WD12701, as they had them on display near the entrance to the store. Thus far it's done a great job picking up water that's trying to enter my home. The only reason I gave "Ease of use" a four is it's a bit tricky getting the lock downs on the lid to align with the tub. Rated 5 out of 5 by KDona91 from Works great Bought this shop vac for remodeling around my home, cleaning up my shed, all around miscellaneous projects, for the time that I have had it, I’ve used it for wet and dry vacuuming and is still running strong. Strongly recommended purchasing and putting the muffler on the discharge to reduce noise and prevent anything from being blown out if the filter inside is removed. I lost my booklet and would like to pick up the last bit of water in the bottom of my hot tub after draining? My vac is not the new version. Take out the bag, put on the squeegee attachment, and have at it. Empty the vac when you are done and let dry before you insert the bag back in. Is there supposed to be a rubber gasket or seal between the top and bottom? Mine doesn't have one. No, the vac does not come with a gasket or seal between the vacuum head unit and the catch can. I hooked hose to vacuum port and it worked well. I turned it off I returned later, turned it on and blower port was on,.. with hose in vacuum port. Cant get it to vacuum again. it will always vacuum from the vacuum port and blow from the blower port. it's possible you clogged the hose. What is the Constant Runtime rating on this unit ? I am wanting to use this at a Dust collection for my Xcarve CNC and want to know if I can run it for 3-4 hours at a time without doing damage to the motor. It should run just fine for that that long. We use these shop vacs at my work and have run them for full 8 hour shifts. How do you install VF3502 filter bag on the WD1270 vacuum? In the previous question about bags for this model, the answer give was to use the VF3502 filter bags. However, the instructions for installing the bag on the 2 rib inlet tube don't match the anatomy of the WD1270, which has an inlet tube that is molded into the body at the bottom so the cardboard collar cannot be attached. I noticed a slight variance in the instructions and the actual vacuum also. But not to worry, it still attaches between the two ribs just as the instructions say.